I did a leak test on my lund and found these hairline cracks. Found some other leaks too. 3: Drill the rivet head just deep enough to pop it off with a chisel and weld the cracks and whats left of the rivet from the outside of the hull. Or is there another way to go about fixing these? I'd rather do it the right way than to put a bandage over it. if these pics come out in the right order to cracks will be first. There is a crack near to the of the rivet on the right and left side. Also there is a small crack at the 9:00 position going down at a 45º angle. The second pic is the tail of the rivet on the rib. Drilling a round hole at the end of a crack is the way to stop further propagation of said crack, but I'd try another repair first, if it were mine. Add a mark and/or take pictures so you can monitor it, then just make it waterproof. Many methods have been illustrated on here. If not subject to further stresses, those cracks may not grow any further. That rivet/area had to take one heck of an isolated and focused hit to cause that tin alloy to crack! I lift the boat on/off the trailer with 2 chain hoists. The area of the crack is about where the ratchet strap goes around the boat and then i hook the hoist to the strap. Since finding the cracks i made a brace that goes side to side across the gunnels. I thought that maybe as i was hoisting the boat it squeezed the sides enough to cause the cracks. Does that make sense? The purpose of drilling the ends of the cracks is to reduce stress concentration at the sharp edge. In machining materials, you always put a radius (fillet) on your inside corners to better distribute the stress when that part comes under load; sharp corners and edges concentrate the stress in the material and lead to structural failure. 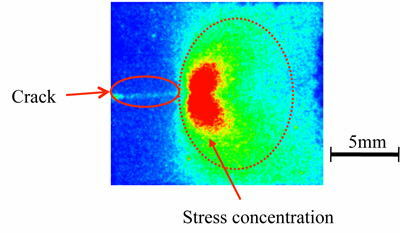 Below is an image showing the increased stress in material at the end of a crack; that increase stress results in material failure and allows the crack to run. The actual end of the crack is not always visually evident and using a larger drill bit will ensure that you eliminate the sharp edge and stop the crack propagation. If you use a small drill bit and don't quite remove the tip of the crack, it will continue to run after your drill stop. If this area is under stress regularly as the tie down point, I would definitely drill the ends of the cracks to stop them running. Ok got it. 3/16 seemed a bit big for hairline cracks but I understand the reasoning for it. I would put a patch on the outside of the hull that covered all 3 rivets and several more new rivets all sealed with 3M5200. But again, if this were mine ... I'd patch and monitor it ... but that's me. DaleH the liquid cold blue sounds like a good idea. I'll have to check the local wal-mart. I don't doubt that your initial suggestion would work. Once i get the new floor/deck in it won't be an easy place to monitor or repair. Once i get the new floor/deck in it won't be an easy place to monitor or repair. Well now, clearly THAT changes everything! If mine AND I was going to add a floor, then I'd fix it properly now. I can't see enough hull or know its location well enough to know WHY it might have cracked. I've seen frp suffer stress cracks enough to know that the more brittle surface gelcoat doesn't tolerate flexing as well as the laminated substrate. But stress cracks are cosmetic only (unless caused by a poor superstructure design and/or core/layup, as then they indeed are a symptom of a bigger design issue). DaleH thanks for the offer. I'll see what i need. I finally got my rivets, clecos etc. I'm making the patch out of 1/16" aluminum with 3m5200 between patch and outside of hull. Should i put a patch on the inside of the hull also. Kinda sandwich the cracks/hull between the patches with 5200 on both sides of hull? The cracks are below the waterline and I plan on putting new floor/deck over the patch(s) area. I finally got my rivets, clecos etc. I'm making the patch out of 1/16" aluminum with 3m5200 between patch and outside of hull. Should i put a patch on the inside of the hull also. Kinda sandwich the cracks/hull between the patches with 5200 on both sides of hull? The cracks are below the waterline and I plan on putting new floor/deck over the patch(s) area. Where you won't be able to get to the area of repair easily once you add the deck, I think I'd patch it well. If structural issues aren't a concern, I'd think that a patch inside done well would suffice. Also take a look at this stuff, $20 for the G-Flex - http://www.tinboats.net/forum/viewtopic.php?f=3&t=40954&hilit=650 - and would be inclined to use this over 3M 5200. I'd also ensure that the area was scuffed, washed with vinegar, dried, and then the area to be patched primed w/ self-etching zinc chromate primer, even the spray stuff from the auto store. Then with G-Flex added, it would be sound and pretty much permanent. In fact, I'd probably wet-out the patch and patch area with the G-Flex and then it kick or set up a little, then would buck in place, but maybe NOT all the way tight, which can make a 'dry' joint by squeezing out all the goo. Then weep/wick in some more G-Flex as shown in their Tech Help videos and articles. FWIW a friend's boat had some porosity where the aluminum that sat on wooden bunks for years (saltwater boat) looked a little like a sponge - tons of tiny corrosion holes. We prepped the area and did as above and with those same materials, less no surface patch was needed, and the repair is sound and flawless. I put some G-flex on a sound area of the hull, properly prepared as above, and used it as a "test area". I put a heavy-duty wallpaper-type scraper to it and it would not budge nor scrape off, the blade just slid off the area. To get any of it to chip off, I had to put the blade at a good steep angle to get a bite and then needed to whack the back of the tool with a hammer or such ... that's the only way I could damage this test area. I did this on purpose, as I intend to review this area everytime I pull the boat out for the season. Great advice on how to repair it. Now, let's discuss why the cracks are appearing and what you might do to prevent future issues. You already probably answered the question. It sounds like your hull is flexing when you hang it on the straps. The straps pull in; the hull flexes; the cracks appear. Your idea of putting a "spreader" on top sounds good. I'd still worry that, IF the straps SLIDE through the end of the spreader, you are still going to have lots of pressure on the gunnels/sides. I think I'd consider adding some 2x6s (non-treated) blocks right in the middle of the strap(s). I envision that the 2x6 blocks would support the keel (not the sides) and take some of the pressure away. Heck, I can't SEE what you have, so I am only speculating. Also take a look at this stuff, $20 for the G-Flex - http://www.tinboats.net/forum/viewtopic ... &hilit=650 - and would be inclined to use this over 3M 5200. I'd also ensure that the area was scuffed, washed with vinegar, dried, and then the area to be patched primed w/ self-etching zinc chromate primer, even the spray stuff from the auto store. Then with G-Flex added, it would be sound and pretty much permanent. I washed the patches with soap and water then a 50-50 water/white vinegar mix also wiped with acetone. Put on a light coat of rustoleum self etching primer followed by two lite coats of rustoleum paint. I have some g-flex coming today but it is the 655 pre thickened stuff http://www.westsystem.com/ss/g-flex-epoxy/. Do you think that would work the same? It would be a 60 mile round trip IF I could find some 650 in the cities. Do you mean running the 2x6s parallel to the strakes or across them? I'd invite you up to Illinois for the weekend but I feel that would be asking to much lol. Ha Ha... I used to live in Illinois for the first 40 years. Then, I spent 15 years after retirement up near the Fox River Chain during the Summers. You couldn't get me back anymore, though. I can't afford the taxes. re the 2x6 ...I only meant blocks big enough to fit your strap. i.e. if your strap was 5 inches, then each block would only measure 2x6x5 (really 1.5 x 5.5. by 5 inches.) I was just trying to get some of the weight transferred to the keel, instead of drawing in the sides of the boat. Just an idea..